Paris Panthers powered to pole position in an intensely competitive GCL season-opener, as riders Gregory Wathelet and Darragh Kenny vowed to convert their strong position into a win tomorrow. The wait is finally over and the new-look GCL series kicked off with a thrilling first round on Friday, providing a fantastic spectacle for a glamorous and energetic crowd at the Campo Marte in the heart of Mexico City. The season-long battle has begun for 19 teams, all of whom are eyeing up championship glory at the final of the regular season in Doha and a golden ticket to the GC Prague Play Offs in December. The Paris Panthers duo of Gregory Wathelet with Coree and Darragh Kenny with Cassini Z produced a spell-binding double clear from first draw in Friday’s opening round and they proved unstoppable as poles fell for their rival teams, leaving them overnight leaders ahead of Saturday’s crucial decider. Friday’s GCL track hovered around the 1.50/1.55m mark, but nevertheless stretched combinations with some tricky rollbacks and a total of three doubles on course. An increased field of 19 teams lined up for the start of the 2018 season, with many of the world’s best athletes from different nations joining sides along with an U25 rider, highlighting the immense young talent in the sport. With plenty of tactics in play and new rivalries unfolding, this unique team competition swung swiftly into action in the heat of Mexico City with each team fielding two riders from their roster of five. The curtain raised to the sight of the Paris Panthers, who were represented in Mexico by the intriguing and formidable new combination of Gregory and Darragh. “It was a good start, it was a nice course to ride and my mare jumped perfect,” said Gregory. As we would discover, he and Darragh had made the track look deceptively easy. Monaco Aces’ Simon Delestre and Jerome Guery came in in hot pursuit, but finished on a team total of eight, before the Cannes Stars pairing of Piergiorgio Bucci and Jane Richard Philips racked up 22 penalties. Doha Fursan Qatar, who secured several podium places last season, put forward the experienced duo of Sheikh Ali Bin Khalid Al Thani and Bassem Hassan Mohammed and came home with a score of 10. The eye-catching scarlet coats of the London Knights are another returning team for 2018 with new recruits, the twins Olivier Philippaerts riding Extra and brother Nicola riding top stallion H&M Chilli Willi, taking the spotlight for this opening leg incurring just one time-fault. Next up were the reigning Champions, newly re-named Montreal Diamonds, represented by GCL regular Eric Lamaze with Chacco Kid and new signing Danielle Goldstein with Caspar. They finished on an unexpected total of eight but with plenty to play for tomorrow. 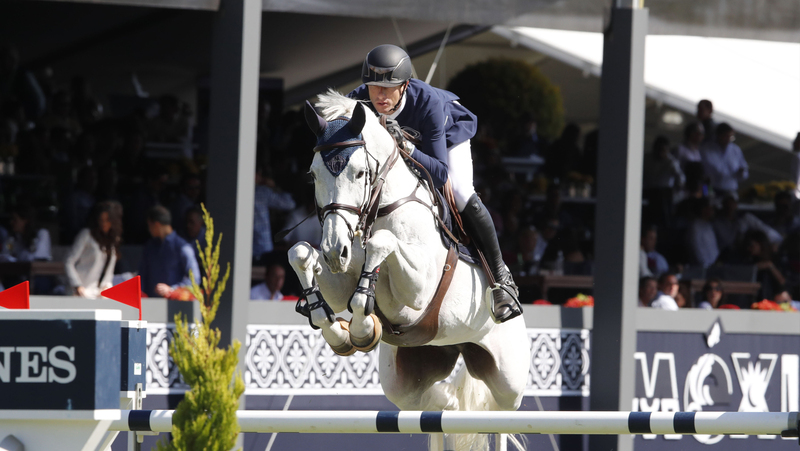 Cascais Charms racked up a total of 11 before Madrid In Motion — another to field a family squad with the father and son pair of Eric van der Vleuten on Wunschkind and Maikel with Idi Utopia — tallied up a total of 14. Next into battle came the Rome Gladiators, still displaying their distinctive green colours, with Lorenzo De Luca riding Limestone Grey proving once again to be a key squad member with a quick and accurate clear. The foot-perfect round took him into the lead individually, before Abdel Said with Jumpy van de Hermitage hit two late rails and added a time-fault to take their score to nine. Another returning team, and inaugural champions in 2016, Valkenswaard United brought back the elite duo of Bertram Allen and Marcus Ehning, who span generations but their team score of four puts them still well in the hunt, breathing down the neck of the leaders as they go forward to round two. “First of all the team is important so maybe I could be a bit faster but we’re in a good position going in to tomorrow,” said Marcus. Making their GCL debut in 2018 are the Scandinavian Vikings and they look very dangerous for the season ahead with Evelina Tovek producing a strong clear on new ride Dalila De La Pomme while second team rider Leopold van Asten and VDL Groep Beauty provided an eight score. With no drop score in this team competition, the pressure told for the returning teams of Shanghai Swans (16) and St Tropez Pirates (17) before new team Hamburg Giants rallied on five to put them firmly in the chasing pack along with the new-look Berlin Eagles (6). The vivid green colours of the Miami Celtics strode out purposefully into the ring with U25 rider Michael Duffy on EFS Top Contender, teaming up with Denis Lynch and RMF Cadeau de Muze for a total of six faults ahead of tomorrow’s final. It wasn’t to be for New York Empire’s riders David Will and Scott Brash and the penultimate team, Chantilly Pegasus, certainly had wings but the poles fell for lead rider Carlos Lopez and Roger-Yves Bost, notching up a disappointing 19. The roaring Prague Lions had the honour of final draw and, with still only the Panthers to beat on a zero score, the bar was set sky high and they were unable to take the lead. With individual honours and a big money prize also up for grabs, the Massimo Dutti trophy went to team rider Lorenzo De Luca, despite a valiant attempt from the previous day’s speed class victor Eduardo Alvarez Aznar with Fidux in second. Shane Sweetnam riding Main Road, winner of the earlier two-phase, took third in the individual scoring. So the all-conquering Paris Panthers lead the way into day two separated by just one point ahead of the London Knights, with Valkenswaard United just a fence behind the leaders in third. Teams carry through their penalties to Saturday’s decider and, run in reverse order of merit, drama will be build, taking this competition right to the wire. Will any teams substitute in some new riders or swap horses? And who can shake off the pressure in this ultimate team showdown? It’s all set to reach a thrilling climax, so tune in on Saturday to see who will be crowned the victors in the opening leg of the 2018 GCL.